With his investments, Soros has become a billionaire. Unfortunately, for many years he has been interfering in the political and demographic developments in Europe and has been financially promoting ethnic replacement. Now he is turning against CSU, Facebook and Twitter because they are endangering his leftist revolution. 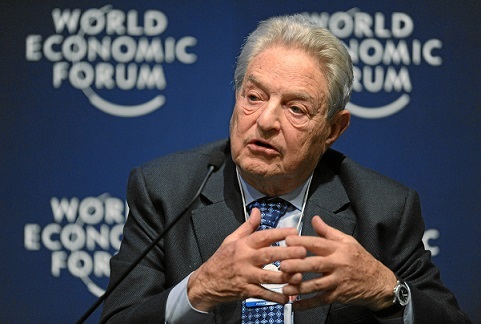 Like every year, Soros gave his speech on the state of the world at the World Economic Forum in Davos (see movie).1)George Soros says “Facebook and Google are finished”, Davos World Economic Forum Speech Jan-26-2018, youtube.com.The neo-liberal quasi self-made sage spoke to his heart’s content, while the open, freedom-loving society he invited soaked in each of his words like a sponge. Now hardly anyone noticed that Soros was trying to take away their freedoms. In the beginning Soros spoke about Russia, which he describes as a mafia state, which adopted nationalist ideology and then he said that the US under Trump’s presidency will become similar in this respect. He now also included Hungary in the axis of evil. It is nothing new because he has always been hostile towards governments that are trying to protect their citizens from the consequences of open borders policies and the idea of an open society. What was new was that he scourged social networks. Soros maintains that since they have grown into powerful monopolies, they influence our behaviour and consciousness (especially during election time) too much. They deceive their users by manipulating their attention and directing it towards their own economic interests and (…) making them dependent on their services (…) The platforms resemble casinos (…) and force people (…) to renounce what John Stuart Mill called the freedom of thought. Is that why Facebook and Twitter are banned in countries like China, Afghanistan and North Korea? Are people really allowed to think freely without access to the internet and the opportunity to post their opinions? No, Soros couldn’t care less about our freedom of expression; he simply doesn’t want us to be able to defend ourselves on these communication platforms against his manipulations, against the propaganda of his NGO network. Soros’s frontal attack sounds all the more hypocritical if one knows that he owns shares of the big tech companies worth 113 million dollars. These are peanuts compared to the $14 billion he has spent in the last 30 years on destabilizing many countries, especially in Eastern and Central Europe, with the purpose of installing open societies there. Soros continues to declare war when he says: “It is only a matter of time before the global dominance of the US IT monopolists is broken. Davos is a good place to announce that their days are numbered.” This should be brought about by regulations and taxation. Taxation, because Soros is besides himself with anger that we can spread our free thoughts for free. He cited EU Commissioner Margrethe Vestager as an example of how to proceed. The head of the anti-trust authority took exception to Google and imposed a fine of 2,424,495,000 euros on the search engine company for its mastery of the market for product search. In 2016, she said: “We believe that Google’s behavior has harmed consumers because they only get the results Google wanted, but they are not the most relevant ones.”2)Von Macht und Ohnmacht, Deutschlandfunk, 2016-07-27.If you google the keywords “EU Criticism”, then the search results and the contents of the websites you can access are certainly not relevant for the EU Commission; they are dangerous for them. Next she delivered a blow to the I-Phone manufacturer Apple The verdict? 13 billion euros as tax. Vestager is thus an important domino in the trade war between Europe and the USA. It is also an element in the puzzle of the cultural struggle carried out on the Internet between the two continents. She will also play a crucial role as the EU’s most powerful woman – chief investigator, prosecutor and judge in one person, responsible for monopolies, mergers, cartels and state aid – in Soros’s private(?) war on freedom of expression. No wonder, then, that the social liberal politician would like to be the successor to Jean-Claude Juncker, the President of the Commission. The question arises: is Vestager in its full power sufficiently controlled by the European Parliament? 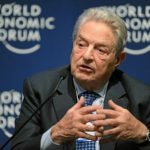 Soros also said in Davos that American technology companies are posing a threat: “There could be an alliance between the authoritarian states and these large high-tech monopolies, whereby the resulting control systems within the large corporations would be linked to the existing state supervisory authorities. This can lead to the emergence of a system of totalitarian control that even Aldous Huxley or George Orwell never dreamed of.” Huxley or Orwell also did not dream that in the age of the most developed democracies, a private network of NGOs within sovereign states would be allowed to conduct hostile policies and harm them: Soros financially supports NGOs that smuggle migrants to Italy on an industrial scale. Finally a quote from our sage, our savior: “The owners of the Internet platforms consider themselves to be the rulers of the universe. In fact, however, they are slaves who will do everything they can to keep their dominant position.” The ruler of the “free thinkers” is now facing a difficult fight against the treacherous American big tech companies that want to conquer Europe, against the nationalist Russian Mafiosi, against the worthless Polish nationalist politicians who defend their right to self-determination within the EU, against the Trump republicans who are building a closed society, against Orban’s Hungarian nationalist insurgents who are busy making fences. Hopefully, in this fight he will lose his dominant position. 1. ↑ George Soros says “Facebook and Google are finished”, Davos World Economic Forum Speech Jan-26-2018, youtube.com. 2. ↑ Von Macht und Ohnmacht, Deutschlandfunk, 2016-07-27.